We were going to post a rumour that we have heard – that the Gardiner Museum of Ceramic Art has let go Sue Jeffries, their enthusiastic curator of Modern & Contemporary Ceramics. We also heard that they might be closing their entire contemporary department, but now we hear that this is NOT true and that they will continue curating contemporary exhibitions. As the worlds of art and design increasingly blend, there are more and more amazing things happening in ceramics. In recent years young designers have collaborated and reinvented the designs of traditional firms – witness the avant garde Dutch design team Studio Job and their Biscuit collection designed especially for Royal Tichelaar. Other artists have long incorporating ceramic into their artistic practices. Thomas Schutte, VoCA’s favorite artist, is well-known for his ceramic pieces, including at Documenta in 1992 when he showed Die Fremden (The Foreigners), ceramic lifesize figures shaped like lumpen vases, with downcast eyes and assorted luggage, which were placed around the German city of Kassel. 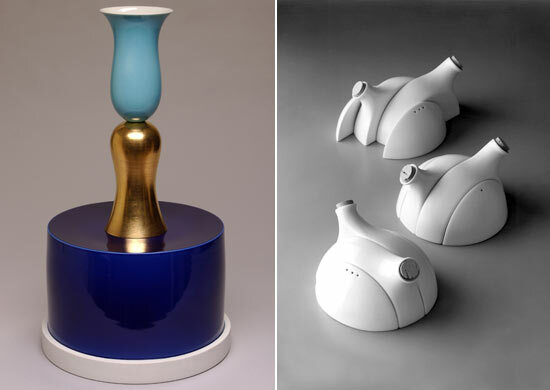 Ettore Sottsass, Vase Cléopâtre, 1994. Pieter Stockmans, Expression salt and pepper, oil and vinegar set, 1991. To fold their contemporary department would have been an outrageously bad move, at a time when the Gardiner’s vibe is relevant and current, what with its beautiful KPMB-designed building, Jamie Kennedy restaurant and its slick recent exhibitions including work by Gertraud Möhwald and the curated shows Object Factory: The Art of Industrial Ceramics and Postmodern Porcelain. Read the great review of Object Factory – with fantastic images – on designboom.com HERE. Re: Susan’s departure: it’s true. The Globe announced it on Jan. 30. (http://www.theglobeandmail.com/servlet/Page/document/v5/content/subscribe?user_URL=http://www.theglobeandmail.com%2Fservlet%2Fstory%2FLAC.20090130.BUZZ30-2%2FTPStory%2F%3Fquery%3DGardiner%2BMuseum&ord=56201318&brand=theglobeandmail&force_login=true).